We all know and agree that red will never go out of bridal style in Pakistan. It’s just the way it is. 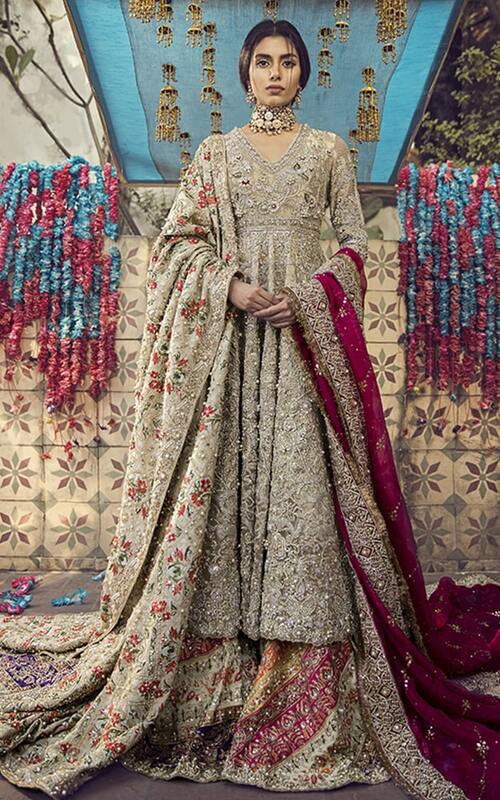 Perhaps it’s because of the fact that Pakistani brides get two chances to get their grand bridal look right i.e. Baraat & Valima. Classic take is to don on red for the first day and go pastel for the reception. 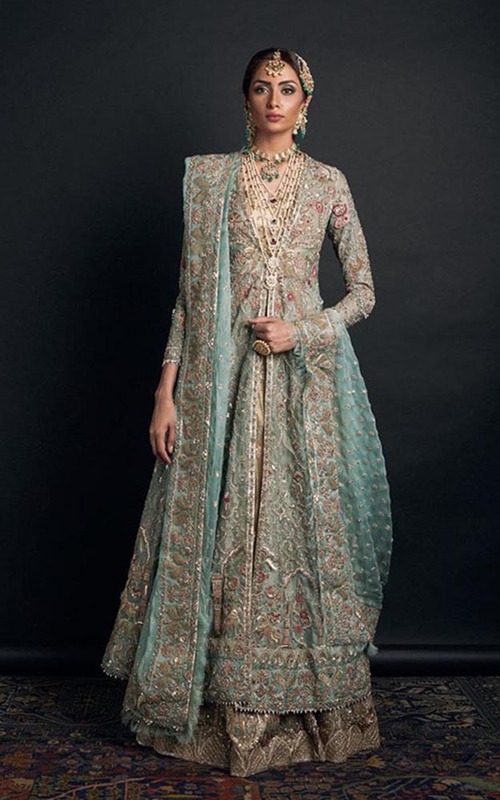 However, given that now brides are getting less formal for their reception, you can also change the look for the question is; are you a bride who is dictated by the traditional norms, or do you wish to do something new and unprecedented? We’ve seen some astonishing combinations donned by real brides and you WILL NOT believe the flattering results. 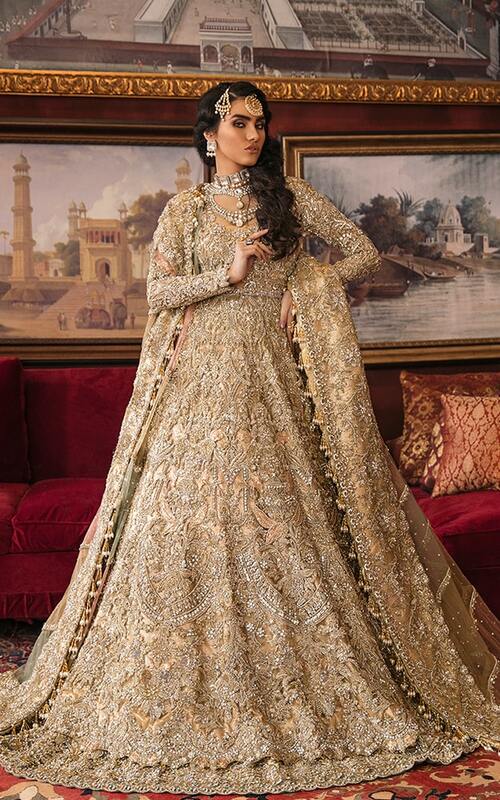 We at bridals.pk think it’s probably time to try on some new colors for your wedding dresses. The real brides from our neighboring country did some experimenting with their bridal dresses and the colors looked rather spectacular. 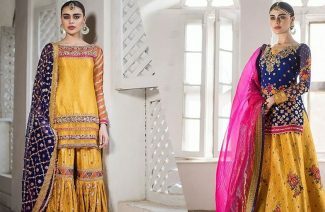 We have brought you the most unique color combinations used by our best designers and that of our neighbor’s to make you rethink your dress priorities. Check out these pretty blues for your wedding. Blues are being loved by brides everywhere. From icy to midnight blue, the color is being rocked by brides everywhere. It’s also a cool and refreshing color, which makes it a perfect pick for the upcoming spring-summer wedding season. You can pick any shade of blue that looks most appealing with your skin tone and wear it like you mean business. Blue has always been associated with men, yet the modern trend of matching outfits is proving that brides can pull off blue with equal sass and look great doing it. 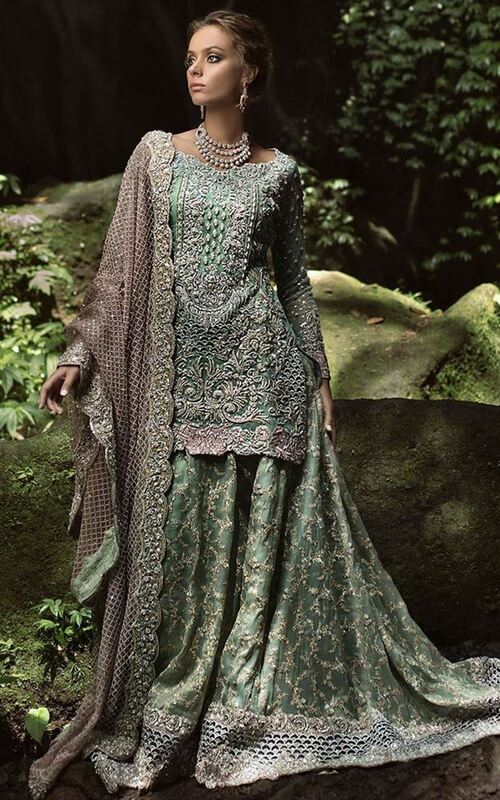 Surprisingly, or perhaps not so surprisingly, the greens are taking over the bridal couture fashion. 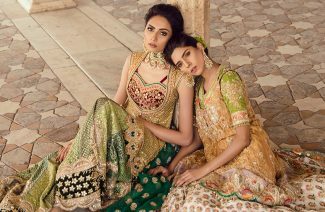 From minty pastels to emerald green, the shade is being redefined by designers like HSY, Tena Durrani, Farah Talib Aziz and Nomi Ansari etc. The sage color, in particular, is making a startlingly perfect bridal color, in combination with gold, fuchsia and rose pink, etc. Green is the color of peace and nature, so if you think that it could present your personality, you must take a chance with it. Greens have looked beautiful on a lot of people, and this years’ bride will be no different. Another surprising, yet beautiful color that’s rising in charts for offering bold mystery to brides is plum. We have to say that we are loving the shade and its hereto forth undiscovered charisma. The palette also gives makeup artists a lot of creative space to play with. You can go all purple or you can use the color accent to enhance your look. It’s fun, it’s dramatic and it’s a bold choice. If that’s who you are as a bride, then this color could be something really striking for you on your big day. The champagne is a classic color that gives out regal vibes. We really recommend you to pick champagne if your complexion has gold undertoness because it will really bring out the color and give you a glow that will stand out well. Also, a champagne bridal means you can choose whatever jewelry (both contrast and matching) and it will all slay. It is good for both day and night functions. 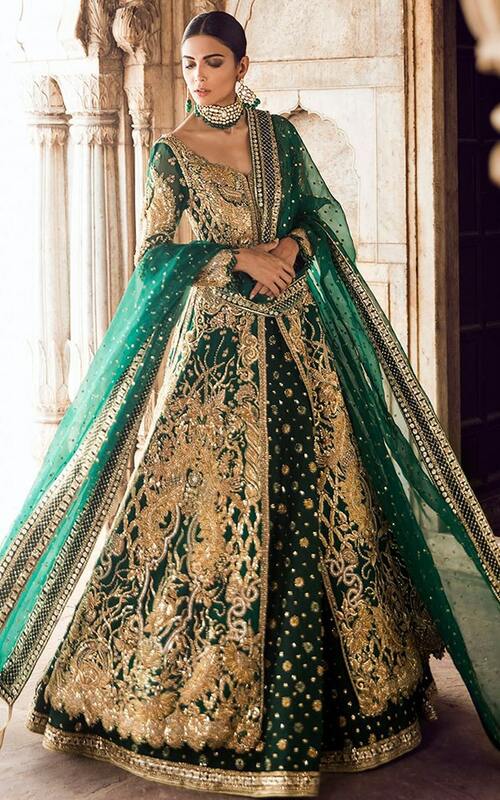 Metallic tones are really getting peoples’ interest these days, but no matter the trend and the age; one cannot go wrong with the champagne bridal dress. It’s like the second most acceptable bridal color after red. 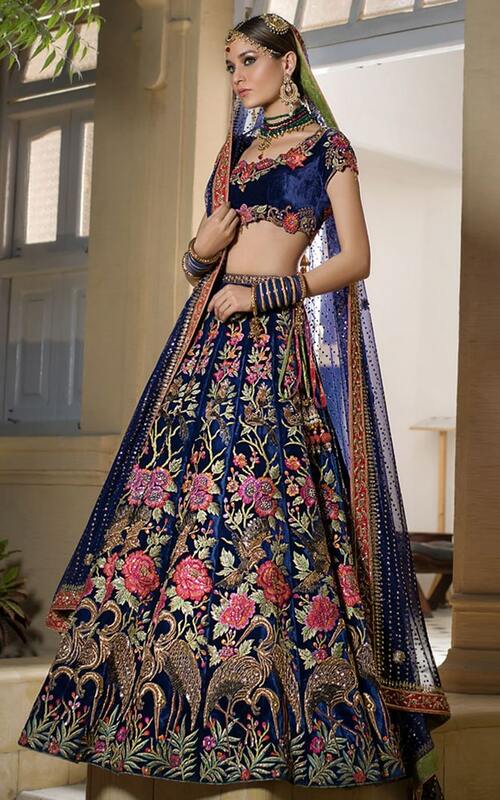 Now that we know that Living Coral is the Pantone color of the year 2019, you will see shades of pink and peach come into play in bridal lehengas. Pink has been trending in the wedding landscape for a while now and that’s not going to change anytime soon. Plus, it is a great color for a spring summer wedding. It’s soothing and you can combine it with so many exciting colors. Celebrity brides like Neha Dhupia, Anushka Sharma, Mira Kapoor and our very own Sanam Saeed proved pink to be all kinds of feminine and really pretty for your bridal attire. Ivory is another color that’s not moving for a while, and we are happy for it. 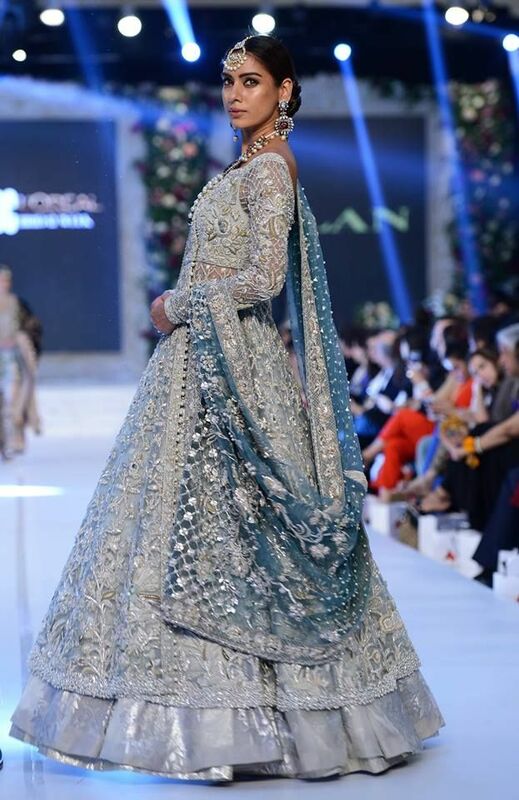 The metallic grays with slight colored accents make for a really pretty lehenga combination.